The EGO 20" Hedge Trimmer attachment is part of the EGO POWER+ Multi- Head system. Designed for convenient and efficient trimming. The dual action blades cut an industry leading 1” cut capacity! The 20” steel blades ensure durability and longevity, while the 12-position articulation allows you to cut at any angle. 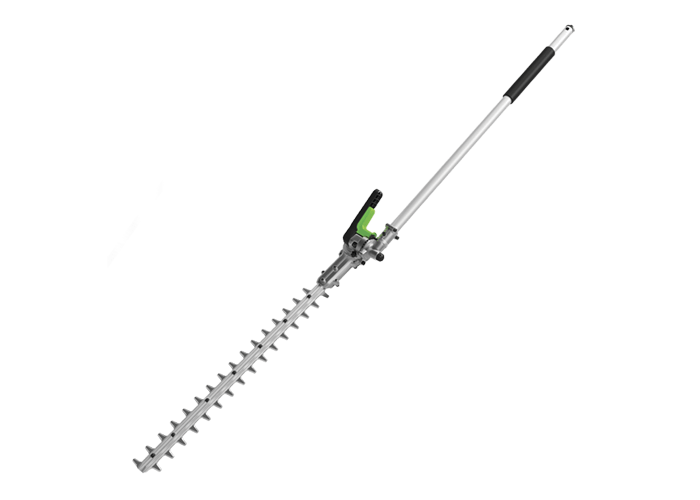 The EGO 20" Hedge Trimmer attachment is part of the EGO POWER+ Multi- Head system. Designed for convenient and efficient trimming. The dual action blades cut an industry leading 1” cut capacity! The 20” steel blades ensure durability and longevity, while the 12-position articulation allows you to cut at any angle. EGO attachments are designed specifically for your EGO POWER+ Power Head (PH1400) and offer the highest quality and performance. The EGO 10" Pole Saw Attachment and Power Head are part of the EGO Multi-Head System. The 10" pole saw provides efficient cutting and limbing, while the automatic lubrication system lets you work until the job is done. The Power Head is the heart of your EGO POWER+ Multi-Head System. The high-efficiency brushless motor makes the most of any EGO 56V ARC Lithium™ battery. Extend your reach and get more from your EGO POWER+ Multi-Head System. The 31-inch aluminum extension pole securely attaches to the Power Head and both the Pole Saw and Hedge Trimmer attachments. ...If you have tall hedges, this is a must-have attachment that makes quick work of trimming even the tallest or widest of bushes with ease...I could hardly believe how many angles are possible to achieve...This is a more versatile and maneuverable attachment than I ever could have imagined!